Narrowly beaten in his last two starts, SUPER FORTUNE returned to winning ways to notch his fifth win in eight starts in the S$125,000 iRace Classic at Kranji here tonight. Olivier Placais, who has partnered the Mossman gelding in all his previous runs, was again on board the four-year-old in the Kranji Stakes A - 1200m event. The pair settled in fourth spot behind the odds-on favourite TANNHAUSER who set the early pace. But the leader surrendered his lead at the home bend, with the rest of the field bunched up. SUPER FORTUNE was stuck on the rails with nowhere to go but it was half way down the straight when he finally managed to swift out for a run. He quickly grabbed the lead and went on to win by length from GOLDEN SWORD. "I thought we came out too early. He stopped a bit in the last 200m, but he does that all the time,” said Placais. 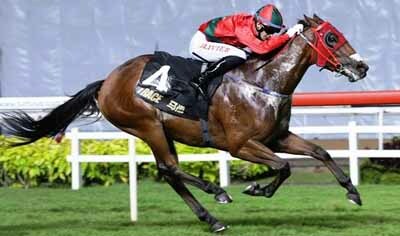 SUPER FORTUNE raced six times in Australia for a win and three placings before coming to Singapore.